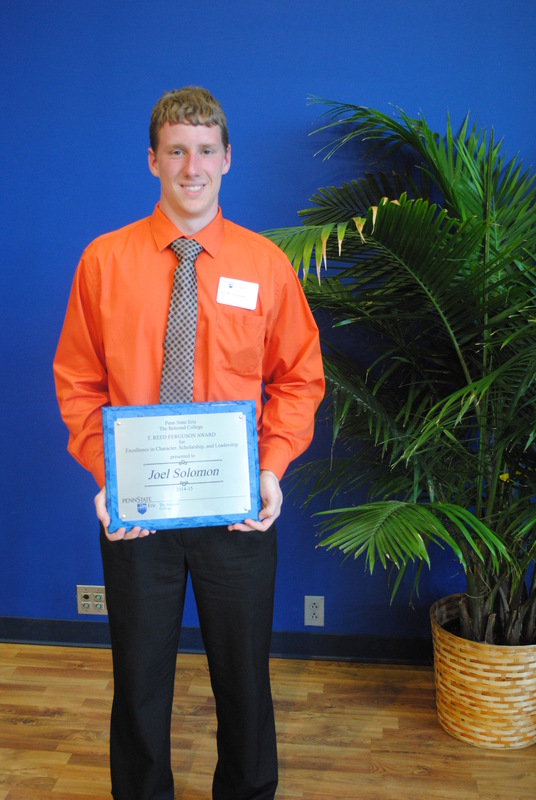 Joel Solomon, a physics major, was the recipient of this year’s T. Reed Ferguson Award. The award recognizes a junior who has demonstrated scholarship, leadership and citizenship through academic and out-of-class involvement and gives promise of further achievement in the senior year. For some kids, it’s Cartoon Network. For others, it’s Nickelodeon. For Joel Solomon, it was the Science channel? Math and science resonated with Solomon, and that interest led the New Wilmington, Pa., native to Penn State Behrend. As he got older, he knew he wanted to pursue research in college, and he could think of no better destination than Behrend. This past year, Solomon collaborated with Bruce Wittmershaus, associate professor of physics, on a research project titled, “Concentration Dependence of Coated Gold Nanoparticles for Metal Enhanced Fluorescence.” The project was recognized as the Best Poster Presentation this past April at the Sigma Xi Undergraduate Student Research and Creative Accomplishment Conference. Undergraduate research has been a big part of his time at the college, but Solomon’s interests go beyond the academic realm. For the past three years, he’s been a goalie on the men’s soccer team. This past year, Solomon was inducted into Chi Alpha Sigma, a national society that honors collegiate student-athletes who excel in both the classroom and in athletic competition. The society recognizes student-athletes who received a varsity letter in their sport while maintaining a cumulative GPA of 3.4 or higher throughout their junior and/or senior years. Solomon is also a former AMCC All-Academic selection. “I feel as if soccer complements my academics. Just being physically active helps me keep up with my coursework,” he says. Solomon’s accomplishments on the field and in the classroom played a key role in his receiving the 2014-15 T. Reed Ferguson Award last April at the college’s 66th annual Honors and Awards Convocation. The award recognizes a junior who has demonstrated scholarship, leadership and citizenship through academic and out-of-class involvement and gives promise of further achievement in the senior year. For the future, Solomon plans to attend graduate school and possibly work with optics. His ultimate goal, though, has its roots in the programs he watched on Science as a boy. Vee Butler was in search of a draw. She needed to find a speaker capable of filling the house. 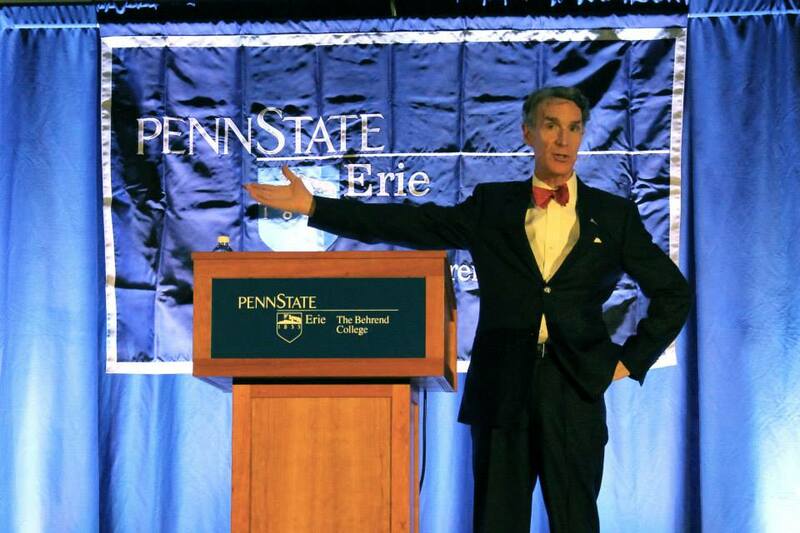 “I just saw (Bill Nye’s) name and I thought, ‘What do ’90s kids like more than bonding with other ’90s kids about ’90s things?’ It seemed perfect,” said Butler, a junior arts administration major and executive director of the Lion Entertainment Board at Penn State Erie, The Behrend College. A jam-packed, standing-room only crowd of almost 2,000 squeezed into Junker Center at Penn State Behrend Wednesday evening to watch Nye as part of the college’s Speaker Series. Nye hoped to inspire students to change the world, but it’s clear he’s already done his fair share of inspiring. It’s been 15 years since a new episode of the PBS television show “Bill Nye the Science Guy” has been produced, but the effects of the show are still evident today. Sophomore chemistry major Joshua Wilkins said Nye’s show actually inspired him to pursue a science degree. He was more than a little excited when he heard that Nye would be visiting Behrend. 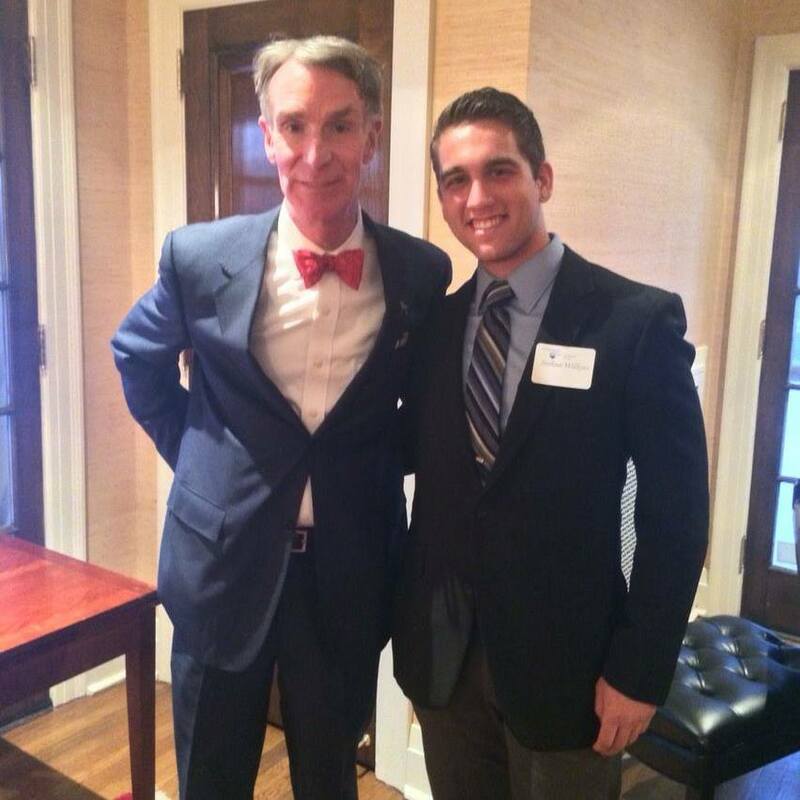 Wilkins said “Bill Nye the Science Guy” is one of his most cherished memories from the sixth grade. He recalled struggling to get through science class, but things always became bearable once the teacher popped a “Bill Nye the Science Guy” tape in the VCR. “He made science funny. We could all feel his enthusiasm, and he was always the guy we wanted to see because he took us away from the traditional classroom setting,” Wilkins said. Junior project and supply chain management major Chad Muscarella agreed. In its five-plus year run on PBS, “Bill Nye the Science Guy” won 18 Emmy Awards and continues to be used in classrooms for educational purposes. An attraction at Walt Disney World’s Future World at Epcot, Universe of Energy, is based on the program. Nye also has written five books under “The Science Guy” moniker. Zany phrases, wacky experiments and quirky music were par for the course on “Bill Nye the Science Guy,” which is one reason Nye believes it continues to be successful. However, even Nye is at a loss for words when he hears of how the show has inspired lives. “Our catch phrase is ‘Food. Beer. Science,'” said Dr. Jay Amicangelo, associate professor of chemistry. They had me at food. Beer sealed the deal. 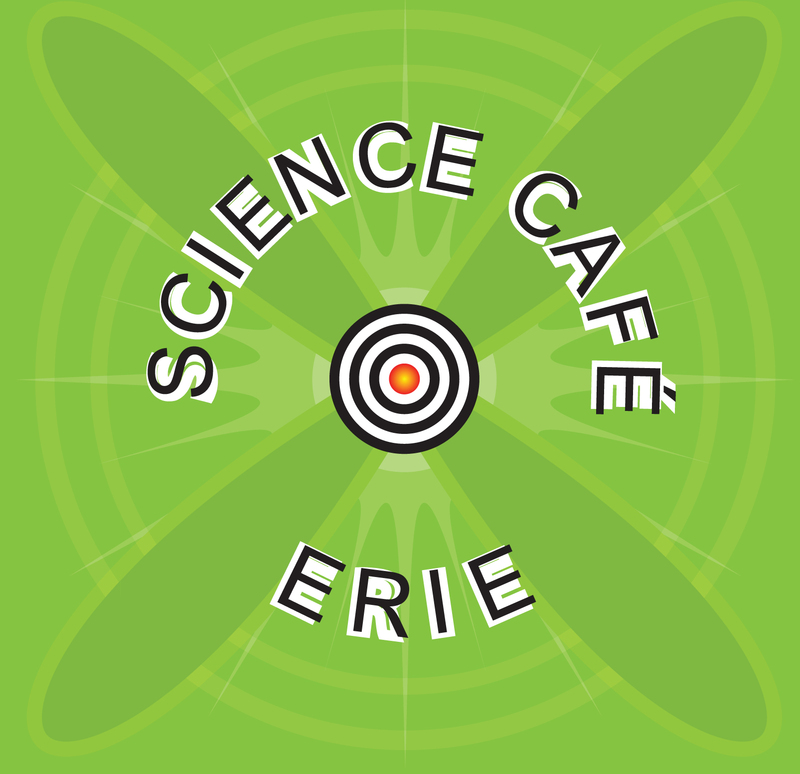 So last night, my 10-year-old-daughter, a budding biologist, and I attended the November Science Café at Calamari’s Squid Row, a bar and restaurant in downtown Erie, along with 50+ other people. Many were college students, probably earning extra credit, judging by the note taking I saw going on but there were also several families with kids there. Last night’s topic was “Wildlife at Presque Isle” and the presenters were Ray Bierbower ’05 (a Behrend grad) and Brian Gula, Environmental Education Specialists at Presque Isle State Park. The pair clearly love their jobs. Their enthusiasm for the park, nature, and wildlife was evident and infectious. As an avid runner and Erie native, I’ve run every inch of that park more times than I can possibly count and, yet, last night, I still learned some things I never knew. 1. Lake Erie, which is the shallowest of the Great Lakes (210 feet at its deepest point), has more consumable fish than all the other Great Lakes combined. 2. There are typically 6 to 9 coyotes on the park and 40 to 60 deer, and that is a manageable number. There have been as many as 14 coyote and more than 100 deer, which is too many. Cars, more than guns, tend to cull the herd. 3. Presque Isle Bay is home to a “living fossil.” The bowfish is the last of its species, which thrived about 150 million years ago. It has a lunglike swim bladder that opens to the throat, allowing it to breathe air. 4. One of the ugliest species in the lake has a deceiving cute name. 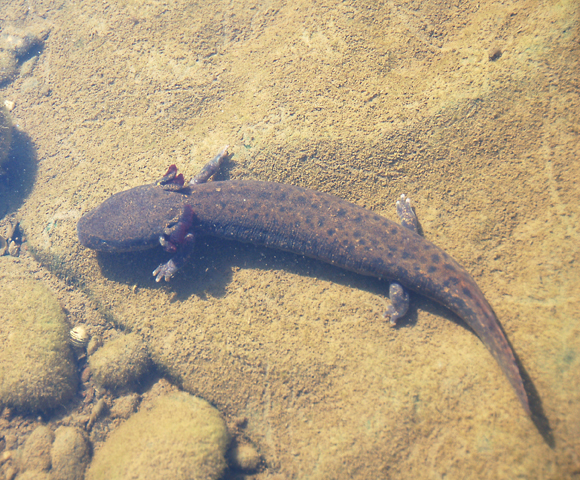 The mudpuppy, which lives its entire life underwater, is distinguished as the only salamander that makes a sound—a dog-like barking. 5. People let all kinds of animals go free at Presque Isle. The rangers have found everything from a skate , a small stingray-like fish, to alligators to pot-bellied pigs to pet rabbits, birds, cats, and dogs. Most of them die. 6. Auto/animal deaths are frequent and are a really good reason to drive the posted 20 m.p.h. speed limit at the park. Three of four fox kits born last year were killed by cars. The mother was eventually hit by a car and killed, too. The rangers don’t blame motorists. “There are 4.5 million visitors to the park every year — that’s a lot of cars to dodge,” Gula said. Beirbower added that he’s had many near misses even when driving 10 or 15 miles per hour. That said, they still wish motorists would slow down and keep an eye out for wildlife when driving around the park. The Science Café was just what Sigma Xi intended it to be — a low-key, informal, but informative scientific “lecture” in non-intimidating environment. My daughter and I enjoyed it equally. 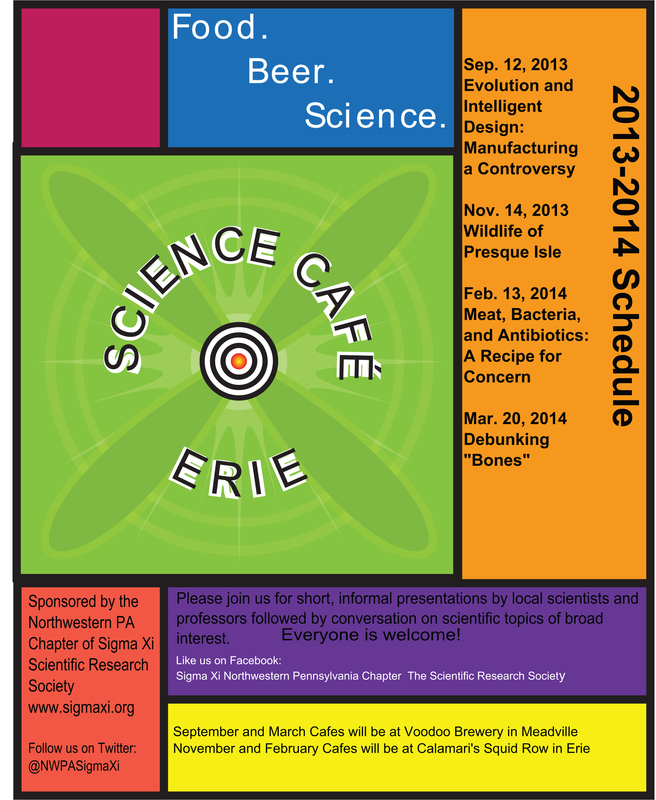 March 20, 2014 — “Debunking ‘Bones'” at Voodoo Brewery in Meadville, Pa. (I hear this place is absolutely worth the drive down I-79).